Are you ready for Cyber Monday sales and Black Friday 2019 deals for Ashley Furniture? We bring you info about the biggest and best deals and discounts here when the savings are announced online or in an advertisement for Black Friday 2019. We are committed to helping you find the best shopping deals of the year from Amazon Prime Day to Thanksgiving Weekend. So get ready to save in 2019, 2020 and beyond! Ashley Furniture HomeStore is no stranger to offering sales and deals, but some of their best deals, sales, prices and offers come up during Black Friday and Cyber Monday. Ashley Furniture has over 700 HomeStore through the United States ready to deliver whatever furniture you order next day and sometimes time same day since the launch of its Ashley Express program in 2014. No matter if you are looking for sofas, couches, lounge chairs, kitchen tables, mattresses, lighting and all sorts of other home furnishing Ashley Furniture has tremendous selection and will have great sales, slashed prices and discount offers for Black Friday and Cyber Monday 2019. 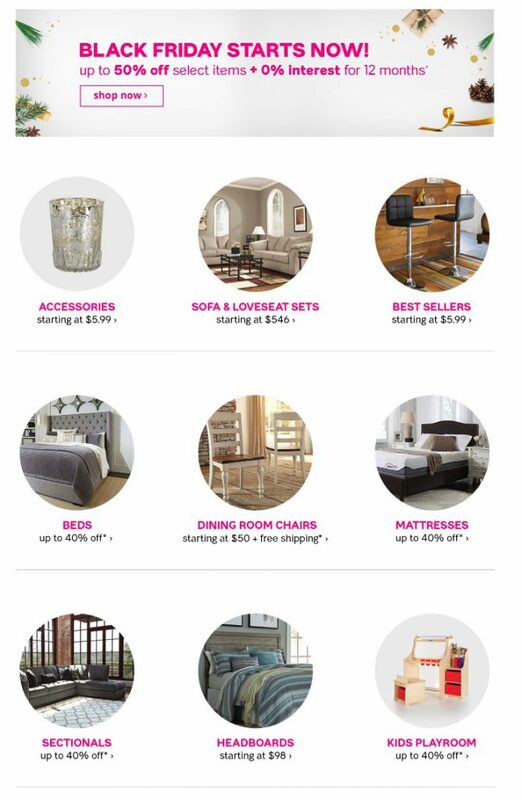 Ashley Furniture Black Friday deals are in, and they have priced stuff to move. Here is what Ashley Furniture is offering so far: The 21 days of Savings promotion is offering deals throughout November and through December 3rd of up to 50% off. They are offering free shipping on a lot of items too and super discounts on overstocked items. Recliners – starting as low $159.99. Area Rugs – starting at $65.99. Mattress in a box – At the ridiculously low price of $119.99 and it even includes free shipping. Dining Sets are starting at $279.99. Couches – Featured deals on the Calion Sofa and loveseat. Whether you are refurnishing a room or just need a few items to finish decorating Ashley Furniture has tons of choices and deals and discounts a plenty. With only a few days left until Black Friday 2019 we are tracking Ashley Furniture closely because we expect some great last minute offers. Keep checking back for updated deals and offers on Ashley Furniture’s Black Friday 2019 offerings. Ashley Home Furniture stores can make an empty room a home. Whether you are furnishing a newly added bedroom, updating the dining room, or need a more comfortable sofa, Ashley has thousands of options. Ashley’s current best sellers include accent chairs, mattress in a box and a lot of exposed metal, as well as white painted furniture. A quick peak at the new arrivals shows that the Bardson sectional in dozens of iterations and the 2018 theme of white painted furniture continues. For the last few years Ashley Furniture has offered up to 60% with additional percent off deals piled on top. For example, in 2017 Ashley had an additional 10% off site wide coupon code, on top of already steeply discounted pricing, for Wednesday through Black Friday. They had some select pre-Black Friday items steeply discounted as door-busters. In the past Ashley has also offered some timed deals on Black Friday morning from 7-11 am. In the lead-up to Thanksgiving, Ashley is current offering up to 25% off during the “More Sale” event, but that’s is just a warm up for Black Friday. We expect Ashley Furniture to offer up to 60% off again this year. They will definitely be offering 0% financing again, but zero % will not last forever as interest rates creep up. However, we expect their additional discounts and timed sales to be better than previous years. Keep an eye out for “HomeStore Specials” (Ashley’s general term for a deal) and they often include discounts as well as special financing options. The HomeStore Special deal moniker will probably carry over into Black Friday. Check back for more up to date information on the timed sales and the in store and online Black Friday 2019 promotions. Ashley Furniture is closed on Thanksgiving. Check local hours for Friday. We will post the ad for this year when it is available. Ashley Furniture is an American furniture store that opened in 1997 and now consists of 450 locations in North America and 520 locations worldwide.